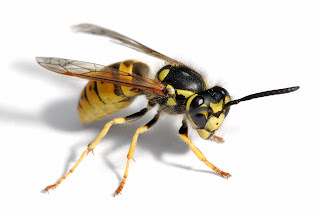 On Wings of Eagles: Lessons from a Wasp. One fine day there was a young boy minding his own business, doing his spelling test when a wasp DARED enter the kitchen. He HATEs wasps, because one stung him in the ear once. He ran out of the kitchen. As he ran he prayed to Jesus that mom could catch the wasp and put him back outside where he belonged. But although she tried to catch him, the wasp didn't seem to understand that we were only trying to help him. He kept flying until his mom gave up. Then he flew to the door! Mom just opened it up and the wasp flew out! God doesn't always answer our prayers the way we ask, but He DOES answer prayers. Sometimes we are like that wasp, not knowing which way to go. We fly around, and like the wasp again, we sometimes keep going farther and farther from God. Jesus tries to get us back, but soon we can't even remember God. Let's be like that wasp and fly back to where we belong. Remember, Jesus is waiting. And when you are discouraged because your prayers for someone aren't being answered the way you think they should be answered, remember, God sometimes has a different but better way to get that wasp back outside! Dear Lord we pray that we wouldn’t get discouraged when things don’t seem to go the way we think they should. Help us to completely trust in You. In Jesus’ name, Amen.